Many businesses live and die by their email list. A robust and growing email list ensures you have a steady stream of leads that you can nurture. And nurturing leads is important because, as MarketingSherpa reports, “73 percent of all leads are not sales-ready.” For the majority of those leads, it will take around 10 interactions with your marketing before they’re ready to buy. It’s no wonder growing their leads list is a top priority for small business owners. In fact, 34.1 percent of the small business owners surveyed in our “2016 Small Business Marketing Trends Report,” listed it as their primary goal. In that same report, 51.1 percent of respondents said they were planning on increasing budgets for digital advertising and social media, with 57.8 percent saying their primary way of marketing their content is through posting on social media. For the most part, small businesses engage in the age-old Internet practice of posting organically on social media. Unfortunately, the returns on those practices are diminishing. For businesses that want social media clicks: At current rates, a brand that has fewer than 1 million followers on Facebook or Twitter is better off paying to promote its best content via sponsored updates than it is paying someone to post social content all day long. And it probably won’t pay off the cost of acquiring followers it already sunk, versus paying just for clicks. As organic reach continues to decline, it will soon be unprofitable for brands with more than a million followers to feed their followings. So, what’s a small business to do? That answer lies in doing what social media platforms want you to do: pay to play. 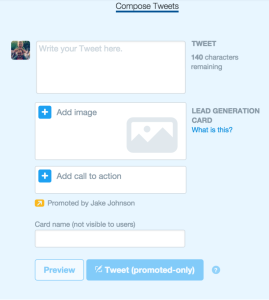 One area of opportunity in the pay to play world that you may not know about is Twitter Lead Generation Cards. 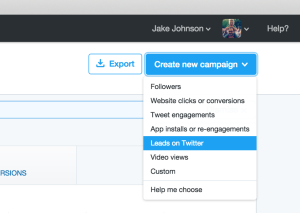 Basically, Twitter Lead Generation Cards are lead generation forms built right into the platform. They effectively replace the need for driving your social traffic to a landing page. And when used right, they can be very effective. 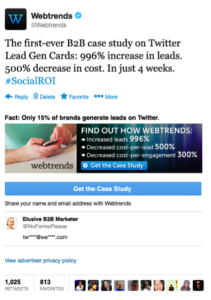 After reading this post on how to set up Twitter Lead Gen Cards, you should definitely check out Webtrends’ post on how they created these results. People spend time on Twitter because they want to find new or interesting things, and that includes brand generated content—if it’s interesting and relevant. One of the advantages to paid versus organic social placement is that you can get very detailed about the demo and psychographics you want to target with your posts. This is a huge opportunity to create a lead magnet like an e-book, white paper, or webinar targeted to a very specific audience and then to promote it for lead generation through Twitter using these cards. OK, you’re convinced that this is worth a shot, but how do you start? 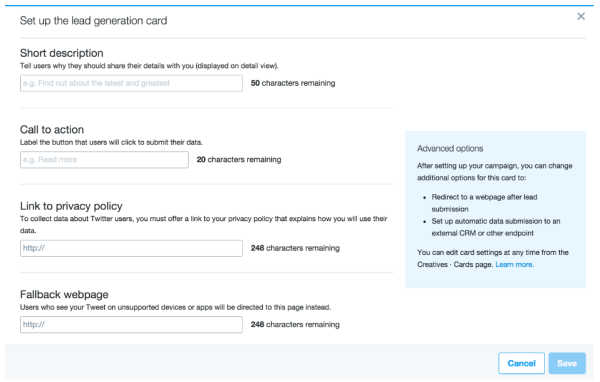 The following is a quick guide on setting up your first Twitter Card Campaign. 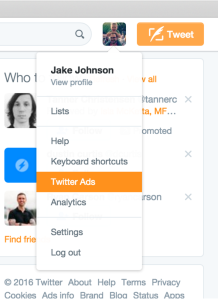 Depending on whether you’ve ever used Twitter Ads before, you may have to fill in some set up information before starting a campaign. This will take you to the campaign set up page, which is a four-part process to getting your campaign ready. The first step is to name and schedule your campaign. Try to be specific and consistent in your naming so that, if you’re running multiple campaigns, it’s easy to know which one is which. In terms of scheduling, you have two options. You can start immediately and run continuously (until your budget is up), or you can set a time frame. This is especially handy for time-sensitive things like webinars and events. This is where you can make or break your campaign. In the end, your conversion rates will only be as good as your ability to target the right people with your content. Behaviors, these are psychographic targets, such as people interested in buying a first home, etc. As you can see, things can get quite granular! Don’t fret, though; Twitter has a number of pre-made terms you can search and use. It just takes a bit of time invested. The more you can know about your audience, the better chance you’ll have targeting them with the right offer to convert. So it’s worth the work. Here you can set your budgets, including either running your campaign through a daily budget or a total budget. In the first case, it will stop the campaign each day when the budget is hit. In the latter, it will run continuously until the budget is gone. Automatic bidding will make sure your budget is spent very quickly. Sure, it helps you win ad auctions, but you don’t really have to or want to win every auction. Keep in mind it’s not like search advertising where you’re bidding on rare priceless keywords that get searched on 10 times per year. This is display advertising and there are plenty of ad spots available to buy. Always use maximum bidding. For most companies doing lead generation, it’s not the end of the world if the lead comes in tomorrow vs. today. The only time you would use automatic bidding is if you need to promote something heavily and you need those ad impressions today (e.g., you have a 24-hour sale) or if you’re targeting a very tight audience, maybe 1,000 people. In these cases, then you do have to use auto bidding—or just bid really high. (You might see that Kim also advises against cards since they look like ads and equal less clicks. Obviously, Webtreds [mentioned above] would beg to differ based on their results. My advice, do as Kim did, run tests, and see what performs best for you). Finally, you’re to the fun part—creating your ad. As you can see, you’ll need to have your 140 or less characters tweet ready to go, as well as an image and a call to action. Again, it’s helpful to have these written out ahead of time so you’ve vetted with your team and are simply ready to plug and play. Once your creative is done, you’re ready to launch your first campaign! Again, now is the time to do some testing and see what works and what doesn’t. Iterate early and often. Once you find a combination that works well, make a bigger run and enjoy the flow of leads that come through. You’ll be building your list and ready to begin those nurture campaigns, turning leads into customers in no time. This was a guest post written by Jake Johnson, who serves as the Sr. Managing Editor for Infusionsoft. Jake works with a team of stellar creators to drive the content marketing initiatives that help small businesses succeed. Entrepreneurial and diverse, Jake has founded two companies, including an interactive creative agency nominated as one of the ten best new agencies in the world by .net Magazine, worked with authors on nearly twenty books, including two New York Times Bestsellers, and overseen the content and creative strategies as an in-house lead with two large non-profits. Join Shoeboxed, Recycle Paper Receipts, Save the Planet!